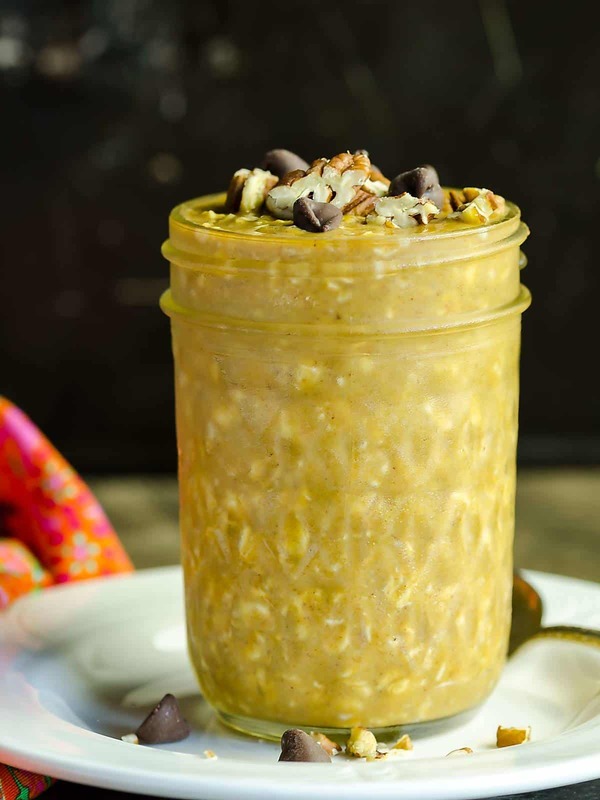 Pumpkin Overnight Oatmeal ~ Healthy, Easy, Quick & Delicious! 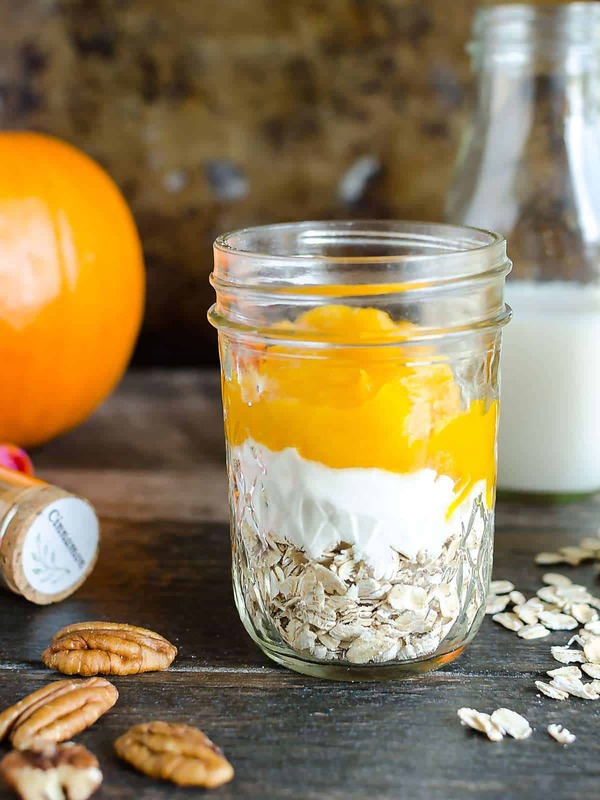 This Pumpkin Overnight Oatmeal is not only delicious, but good for you too! Healthy, quick, easy AND delicious, that’s the perfect way to start your day! Okay friends, I’ve held out long enough on the pumpkin posts. 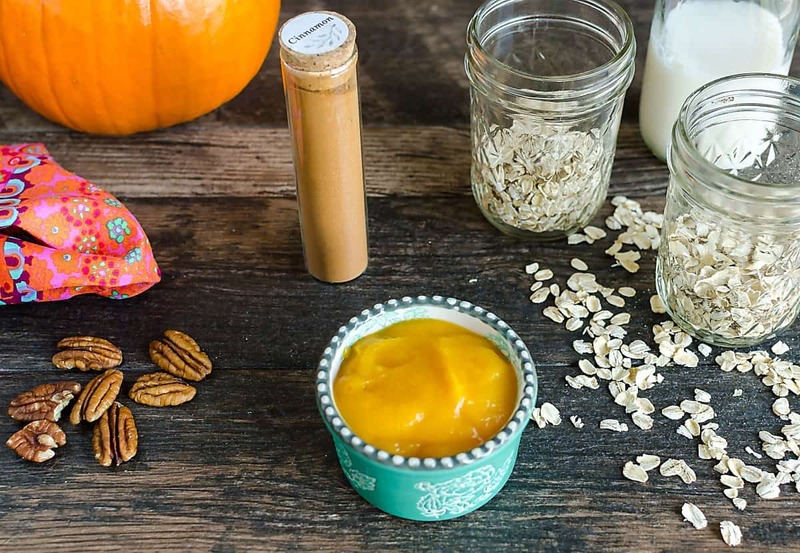 I can’t wait any longer, you’re going to be seeing more starting with this Healthy Pumpkin Overnight Oatmeal. Pumpkin and chocolate are one of my favorite flavor combos, so I had to put it in my oatmeal. This isn’t the first time I’ve put pumpkin in my oatmeal, check out this more traditional Pumpkin Roll Oatmeal. But, I have to say this combo works well, like in these pumpkin chocolate chip muffins, or how about cookies for breakfast that actually keep you energized? Yep, if you want this to be your reality, you’ve got to make the Pumpkin Breakfast Cookies! I know, I know, overnight oats are not a new invention, but I think they’re still all the rage. This takes 5 minutes to prep, then throw it in the fridge and eat it the next day. Flavor combinations are endless, as you know. How about some facts about pumpkin? Did you know it’s good for you? Okay, I’m not saying pumpkin pie is good for you, I mean, it’s great to eat, but there might be a tiny bit of sugar in there and some other things many might not rate high on the ‘healthy’ scale. Reduces cancer risk, due to the anti-oxidant beta-carotene which may play a role in cancer prevention. Beats bananas in the potassium category. Great for post work out! Boosts your immune system due to the Vitamin C.
If you make your own pumpkin puree’, or just happen to carve some pumpkins, the seeds are good for you too! They boost your mood because of the tryptophan, which produces serotonin. Some studies have also shown that the seeds reduce your LDL, or “bad” cholesterol. Use chopped dark chocolate (70-80%) in place of the chocolate chips, and maybe just garnish or use a little less. Use an on plan sweetener in place of maple syrup. This is an “E” meal. 🙂 Enjoy! So that was probably way more than you care to know, but hey, now you know, and can enjoy that pumpkin overnight oatmeal even more. Let’s make this! 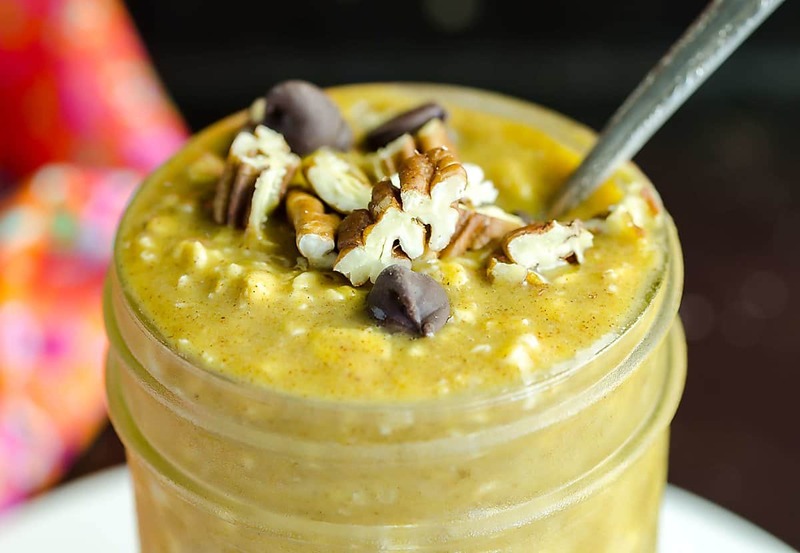 This Pumpkin Overnight Oatmeal with pecans and chocolate chips is not only delicious, but good for you too! Healthy, quick, easy AND delicious, that's the perfect way to start your day! Place the oats, protein powder, pumpkin, pumpkin pie spice, maple extract, almond milk, maple syrup and chocolate chips in a pint sized mason jar. Cover the jar and shake well. Alternatively, you can stir it. Place in the refrigerator overnight. After the oats have set up, garnish with a few chocolate chips and some chopped pecans, enjoy! Ground cinnamon can be used instead of pumpkin pie spice. Truvia, or another stevia based sweetener cab be substituted in place of the pure maple syrup. Any milk or milk alternative works great here.